A new Google Panda update was unleashed in September that has brought chills across the Internet. Why? The thought of any of Google’s algorithm updates hitting a website can send shivers down a business owner’s spine. If your website does not meet specific Google standards, website traffic can suddenly drop drastically. If it does, that is a sure sign that your website has been hit by Panda. Let’s take a look at what Panda is and what you can do as a website owner to avoid the Panda’s rage. Google first released the Panda algorithm update in February of 2011. Named Panda after a Google engineer by the search engine giant, this filter was designed to keep thin or poor quality content from placing well in the search engine’s results. The initial roll out of Panda targeted websites that copied the content of other websites. It also zeroed in on content farms that contained shallow or small amounts of original content. To date, there have been 27 Panda updates according to Search Engine Land. 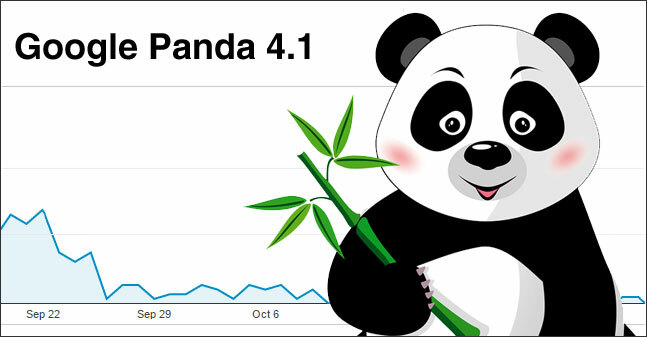 The Panda 4.1 update roll out was officially announced by Google Webmaster Trends Analyst, Pierre Far, on Google+ on September 25, 2014. This improved update was designed to “identify low-quality more precisely” and affected roughly 3-5% of queries. Google Panda is not a penalty, but a filter that sifts poor quality content and keeps the affected site from ranking well. Panda is now a continuous part Google’s algorithm. Traffic will continue to slowly dwindle if the cause of the problem that triggered Panda’s wrath is not identified and corrected. Check your Google Analytics Account to see if there is a significant and sudden drop in traffic. If there has been a traffic plunge, check the dates of Google updates to see if the drop and the date of one of Google’s updates are related. Moz has a comprehensive list of Google’s Algorithm Change History that you can use to check. Check your Google Webmaster Tools Account and see if there are any messages about a manual penalty. You will not see a penalty warning about Panda. The first thing to do is not to panic. Perhaps your website has been up for quite some time and there are outdated blog articles with very low word count that are no longer relevant. That shallow content may not be intentional, but rather an oversight or “a back burner item” that you have been meaning to take care of for quite some time. The good news is that it is possible to clean up the triggers that may have caused the Panda wrath. There are actions steps to take to make your website Panda-friendly. It may take time, but the effort you invest into your website will be well worth it. Take a close look at your website’s pages and perform a thorough analysis. If there are old and outdated blog articles that are no longer relevant or offer any value, delete them. It may be a difficult decision to delete articles that you or members of your team have worked so hard to create over the years, but it is a necessary step in remaining Panda-friendly. If there are articles that can be updated to make them relevant, take the time to revise them and build them up. Are there articles with shallow or thin content covering a topic? If the article is relevant, add valuable information to make it a thorough analysis of the subject, add outbound authoritative external links and graphics. In the past, it may have been acceptable to write a 300 word article focused around a keyword phrase, but now, articles with detailed analysis of a topic will bring search engine rewards. In fact, experts are recommending more “meaty” articles with 1000 to 1500 words. Duplicate content may be unintentional. Some content management systems (CMS) can cause duplicate content out of the box, and website owners are not aware that this happening. WordPress is one of the most popular CMS in the world and is known for causing duplicate content. For example, there may be duplicate content issues with tags, archive pages, category pages and more. To help with this, you will want to use the plugin, WordPress SEO by Yoast and set it up properly to make sure the pages are noidexed. Producing “meaty” articles that are well researched and documented with sufficient word count. Again, experts are recommending articles with a word count from 1000 to 1500 words. Grammar and Spelling: Be sure to check grammar and spelling of each article. Have a second or third pair of eyes reading your content to ensure quality. Run your article through an online editor like the Hemmingway App. The chilling truth about Google Panda, as with any Google algorithm update, is that websites can be hit and drop drastically from the search engine results. The causes that trigger Panda’s filter hitting a website may be unintentional, but may result in Panda’s sting. There are proven steps to take to get back in the Panda’s graces. It may take time, but by following Google’s guidelines, you will be on the road to recovery. Do you have any questions about Google Panda? Did Panda 4.1 help or hurt your website? Please share your thoughts below. WOW! I had no idea. I do appreciate the fact that Panda is a filter and not a penalty. Let’s see where Panda takes us. Thanks to your blog I know I’ll be ready! Heidi, I appreciate the fact that Panda is a filter and not a penalty, too. This means that it may be a bit more difficult to try to isolate the problem, but when fixed, there should be a speedy recovery. What did you think about the “meaty” content of 1,000 to 1,500 words per article? Thanks once again for a very timely post, Robin! Over the past several months I’ve noticed a gradual decline in our organic search traffic. I suspect that your Point #3 (Revise and Build) has had the biggest impact here. Webmaster Tools has shown no red flags or notices, but analytics confirm the decline. It’s hard to conclude exactly why this has happened because I thought I was following all the rules (don’t we all!). And there have been several factors that I think are the culprit. At any rate, I thought I’d share my findings here in the hopes that it may help someone else troubleshoot declining search traffic. I am still not sure if it’s Panda, but the timing of everything is suspect because all of these issues happened at the same time. So it’s difficult to isolate the root cause. 1. The first issue was several occurrences of website plagiarism that I’ve been dealing with; to date all have been resolved. 2. The next issue that hit concurrently with the plagiarism was a faulty redirection plugin. I had no idea the plugin stopped working, but I began to notice problems with a website redirect loop. I finally isolated it to be the Safe Redirect Manager plugin (which has a pretty good rating, by the way!) So I deactivated and deleted the plugin. 3. I had over a dozen broken links that I tracked down and fixed. 4. I wasn’t convinced that Google did a good job of ignoring the backlinks from obviously low-quality and high-spam sites (like Matt Cutts has claimed), but it looks like they do. I was questioning whether to use the new Disavow Tool, but so far, have not. 5. On my “to-do” list was to revisit and update older posts. So your post was a great reminder that there is no time like the present to take care of these issues. I know it will take a while to see whether the housekeeping helps in terms of our search traffic. But I feel better already knowing that I’m doing all I can to give my website visitors the best possible experience. Mchelle, you are very welcome. I’m happy to hear that this article might help pinpoint what may be causing the gradual decline in your site’s organic search traffic. That you for sharing the steps you are taking. Number 3, Revise and Build have been on the top of my list as well. Our blog has been up since 2008, and unfortunately, there were and still are a number of articles that are no longer relevant. A number of the oldest ones were shallow with less then 300 words of copy. As much as it hurts, I’ve been going through them one by one and making the decisions to 301 or delete them. It looks like you have a great plan of action. Thank you for sharing it! I absolutely agree. It is all about giving our website visitors the best possible experience. Please keep me updated on how your action plan is working. Thanks again, Michelle! I have seen a dropped in my traffic for the past week and I myself was alarmed and curious as to why? I have just built my new word press site within the last 5 months and have copied all info over from my old site. This old site is redirected to my new site, and now wonder since I copied the info word by word would this be the issue? I unfortunately have not yet added my new site to Google sitemaps, so it is difficult for me to find any errors. Something I shall do today. In your opinion Robin, do you think copying over my info might of caused this? Cindy, I’m sorry to hear about the drop in traffic. If you used 301 redirects from the old website to the new website, it should not be an issue. Using 301s when changing domain names is a best practice. I’m glad to hear that you will be setting up Google Analytics and Google Webmaster Tools. Both will help your analyze your website traffic. Please keep me updated, Cindy.